2 What Are the Main Benefits of Tankless Toilets? 3 What about the Disadvantages? 4 What Features Should You Consider? Did you know that, over the last couple of years, the popularity of tankless toilets has been on the growth? The compact, modern design is definitely an attraction point for many homeowners. Surprisingly, though, the history of tankless toilets goes back to the beginning of the 20th century. At first, they weren’t really well received. However, that was due to change, over the course of time. Another interesting fact is that most tankless toilets work according to the same principle as they did at that time. So, if you’re thinking that such a unit might be right for your bathroom, our guide introduces the best tankless toilets on the market. Making the right purchase is definitely more difficult than it seems, specifically because there are so many products to choose from. That being said, our tankless toilets reviews aim at guiding you in the correct direction. Dimensions : 32.5 x 15.5 x 21.5"
Dimensions : 27.8 x 15.3 x 21.5"
Dimensions : 31 x 30 x 20"
Dimensions : 21 x 15.1 x 13.9"
Dimensions : 27.7 x 15.8 x 21.1"
Dimensions : 18.2 x 14.5 x 15.8"
Advertised as one of the best compact toilets for small bathrooms, this unit comes with a lot of surprising characteristics. Even though it is at the top of the price range, this product is likely to meet even the highest expectations. The elongated bowl aims at providing maximum comfort. What is more, the minimalist design makes it really easy to keep the toilet clean. Not to mention that there are no hidden lines or spots where the bacteria and dirt could hide. Due to the patented SanaGloss glaze, the surface of the toilet is protected. This way, the original color and gloss of the toilet should be maintained for years to come. Additionally, this toilet is ADA compliant – which is another advantage. You also get a SoftClose seat with the purchase. In lines with the best Toto toilets, this toilet is really efficient. That is thanks to the double cyclone flushing system that does a thorough job while using between 0.8 and 1.0 gallons of water per flush. Plus, the toilet flushes automatically, utilizing only the needed amount of water. 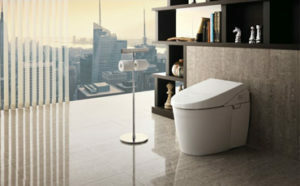 This is another TOTO toilet, characterized by a sleek, modern finishing. The one piece-design with a skirted bowl specifically eases the cleaning process. Since this unit is also patented with SanaGloss glaze, you should consider reducing the use of chemicals. This is highly recommended if you want to ensure that the toilet retains its original color. 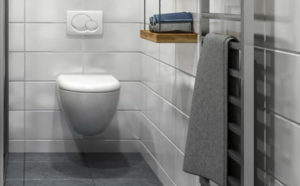 Once again, this toilet is a significant investment – but it is definitely worth the hefty price tag, due to its features. The cyclone siphon jet flushing system guarantees unmatched efficacy. Additionally, you have the option of selecting the water usage – which ranges from 0.6 to 1.6 gallons per flush. That is not all! This toilet also comes with an integrated washlet, featuring three different modes. Other advanced features include the heated seat, the remote control, and the programmable nightlight. However, due to its automatic functions, this toilet could be rather noisy. Some users noted that this could be an inconvenience, specifically for light sleepers. This unit incorporates the functions you would expect of a state-of-the-art toilet and bidet, in order to provide an unmatched customer experience. 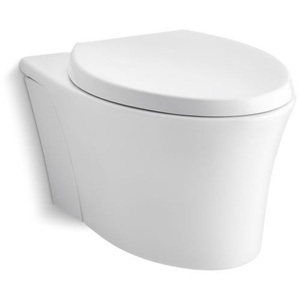 Similar to most TOTO toilets on the market, this model features SanaGloss technology. 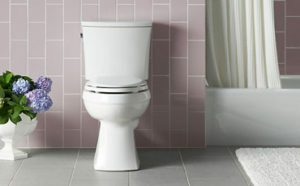 Thanks to this ceramic glaze, cleaning this toilet becomes infinitely easier and time-efficient. Not to mention that you don’t have to use a lot of cleaning products to get optimal results. What is more, this technology impairs the buildup of bacteria. It goes without saying that the washlet cleaning mechanism is also a nice addition. Plus, it comes with a bunch of advanced characteristics, including an air deodorizer and dryer function. Furthermore, note that the cyclone flushing mechanism ensures low water consumption. Plus, you can further adjust the front and rear temperature. That is not all, you can also regulate the water pressure. Since everyone has distinct preferences when it comes to water pressure, this feature ensures a fully customized use. On the other hand, this toilet can be a tad noisy, which was annoying for former customers. This toilet manufactured by Kohler is, without a doubt, one of the brand’s highly appreciated products, and for a good reason. 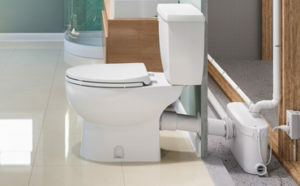 Due to its smooth design, this toilet occupies the minimum amount of space. Furthermore, the dual flush system utilizes 1.6 gallons of water. Plus, it removes any traces of waste, time after time. 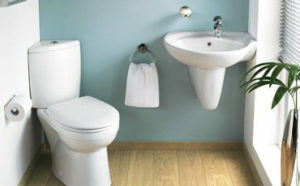 In terms of comfort, this toilet facilitates a comfortable and easy seating. Thanks to its unique Q3 seat feature, you can adjust the seat depending on your needs. What is more, even persons with disabilities can use it without a lot of difficulties. On a different note, the uplifted design comes with an evident advantage. More specifically, this allows you to maintain the toilet clean. 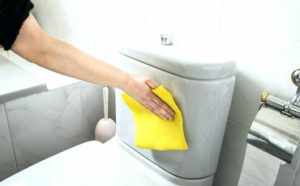 As for the inside cleaning, this is handled by the superior flush system. Even so, this product has some shortcomings you should note. More specifically, depending on the waste exerted, you might need to flush twice, for a thorough waste removal. Additionally, there had been some complaints concerning the comfort level of the seat. 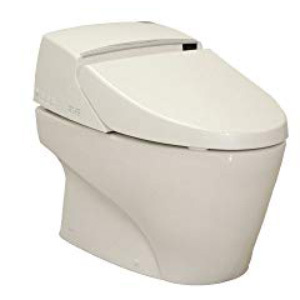 Moving on to another top rated toilet, it comes with an integrated bidet. Hence, you get a completely automated experience. Essentially, this model comes with a range of advanced features such as a deodorizer and a heated seat. Simultaneously, the dual nozzle offers customized posterior wash and feminine wash. Hence, if you want to reduce your use of toilet paper, the integrated bidet will help you attain this. Another great characteristic is, of course, the automated flushing system. 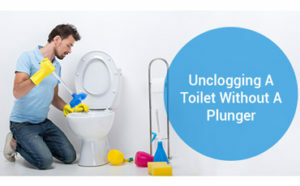 That is to say, you don’t have to trouble yourself with flushing. We also appreciate the modern, sleek tankless design that makes this toilet a great addition to any bathroom. At the same time, the handheld wireless remote control comes in handy. You can use it for adjusting each feature and function so that it addresses your specific needs. Nonetheless, some users complained that the water pressure of this toilet isn’t necessarily the best. Not only that this toilet is ideal for you if you have limited space, but this is an optimal choice if you’re browsing for macerating toilets. 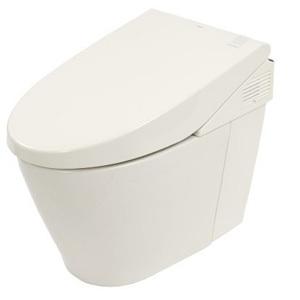 It incorporates a highly efficient macerator, which is located at the base of the toilet. Most notably, though, this toilet utilizes no more than 1 gallon of water per flush. The toilet comes with an electronic timer system that regulates the water usage. That is to say, you can really reduce your water bill costs. Thanks to its unique capabilities, the macerator flushes the waste up to 9 feet above, and up to 100 feet horizontally. This makes it suitable for even the most remote locations, in which you don’t have access to a drainage system. Its design is also minimalist and practical. Concurrently, durability is another noticeable advantage. That is not all, though; if you need to link this toilet to a sink, you have the option to do so. On a different note, in order to ensure that this toilet doesn’t clog, you shouldn’t flush wipes or anything else of the sort. Otherwise, you’ll inevitably deal with unwanted clogging incidents. This is, perhaps, one of the most advanced toilets manufactured by TOTO. It comes with a wide range of automated, state-of-the-art features, the compact size making it a really practical acquisition for small bathrooms. This is far from being a standard toilet since it is equipped with a programmable nightlight. This unique characteristic definitely comes in handy for a family with children, who are usually afraid to go to the bathroom at night. We could also argue that this is a self-sufficient toilet, in the sense that it minimizes your input. The lid closes and opens automatically. What is more, the seat comes with an adjustable heat feature. 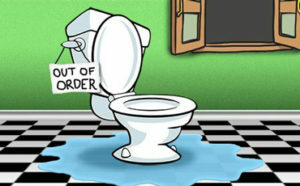 Moving on to the water usage, you should know that this toilet uses between 0.9-1.6 gallons of water. The amount of water is adjusted, as the situation asks for it. 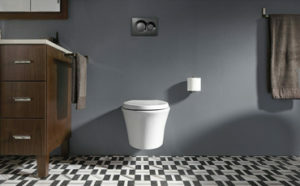 Essentially, the minimalist design of the bowl plays a role in maximizing the efficacy of the flush. Also, this toilet features SanoGlass technology – this is a material that safeguards the surface from bacteria and corrosive chemicals. On the other hand, the self-cleaning function of this toilet could be rather troublesome during the night. Hence, if you’re a light sleeper, this might disturb you. What Are the Main Benefits of Tankless Toilets? 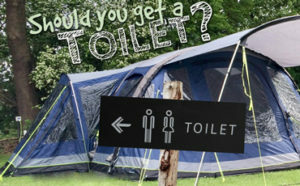 If you’re thinking of investing in one of the toilets mentioned above, we believe that the benefits we are about to outline will convince you. To start with, tankless toilets are much smaller than standard toilets. So, if you have a small bathroom, getting a tankless toilet is the way to go. Plus, thanks to this, you can install the toilet almost anywhere. Moving on, another characteristic of tankless toilets is that they use less water in comparison with other models on the market. Why is that? This is because many products have the dual flush feature, utilizing the right amount of water time after time; thus, they reduce waste. Plus, since the water enters the bowl at a high pressure, less water is necessary for an effective cleanse. In fact, you can save up to 40,000 liters of water by replacing your current toilet with a dual flush toilet. 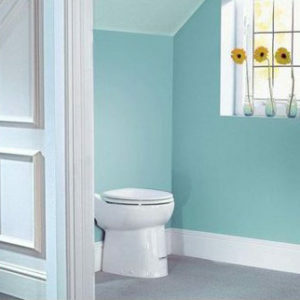 If you’re into minimalism, choosing a tankless toilet will definitely be down your alley. Most manufacturers create units that look impeccable and modern, meaning that such a product will definitely improve the aesthetics of your bathroom. What is more, another great thing about tankless toilets is that they are user-friendly, in the sense that they come with a wide range of advanced features. Additionally, cleaning them is really easy and time efficient, thanks to the minimalist design. Since tankless toilets work differently, you should note that the installation process differs, as well. So, while there are many advantages that come with the territory, a disadvantage worth noting is that the installation process could be cumbersome. Plus, keep in mind that most models are electrically powered. So, if there’s no power, this means that the toilet won’t flush. What Features Should You Consider? If you want to invest in the best tankless toilet on the market, there are several things that you should consider. 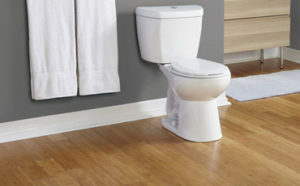 The main thing you expect of a high-quality toilet is to facilitate unmatched flushing performance. And this is the case for most tankless toilets – the top products, at the very least. 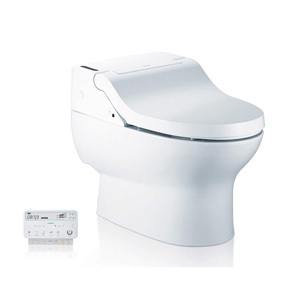 For example, many of the models we presented to you are equipped with a dual flushing system. This includes a full and a half flush. The good thing about this type of flushing system is that it diminishes water usage. Meanwhile, other models are equipped with an automatic flushing system. This automates the entire process. 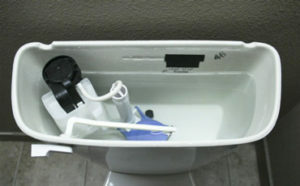 Additionally, other toilets incorporate a flushing control mechanism. This is, usually, a water valve that regulates the amount of water per flow. 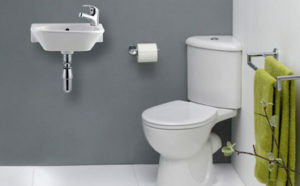 Tankless toilets can either be wall mounted or floor mounted. 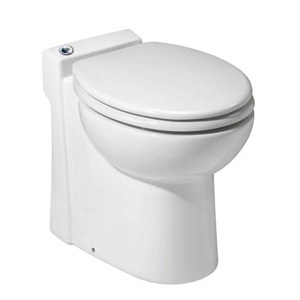 When choosing between these two types of products, you should consider the weight and the design of the toilet. That is to say, if you prefer a clear, neat aesthetic design with a clear floor, then a wall-mounted toilet might be better suited for you. At the same time, an advantage associated with these units is that cleaning it is much easier. 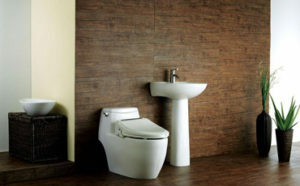 Hence, wall-mounted toilets facilitate a clearer aesthetic, while making it easier to clean. Nonetheless, you should determine if your wall supports this kind of weight. Moving on, tankless toilets come with a wide range of advanced features. The higher the price range, the higher the number of features. For example, some units come with a remote control, allowing you to customize the toilet depending on your preferences and specifications. Other units incorporate an automatic lid, which closes and opens automatically. This characteristic comes in handy, specifically for families with children. Some tankless toilets are easier to clean than others, depending on the design of the unit, as well as the manufacturing material. For example, some of the toilets we presented feature SanaGloss technology, which impairs the buildup of bacteria and germs. Additionally, it is highly recommended to restrict your use of chemical cleaners in this case. On a different note, make sure you factor in the shape of the bowl for use of cleaning, as well. Does It Come with a Washlet? 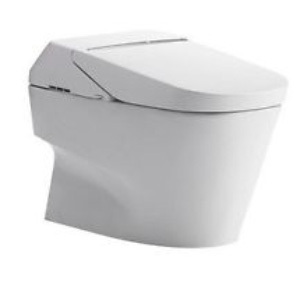 Some tankless toilets are equipped with washlets, which aim at reducing the utilization of toilet paper. At the same time, in terms of efficiency, using water is much more efficient when it comes to removing waste, in comparison with toilet paper. Plus, if the toilet you choose features a washlet, you can regulate the temperature and pressure of the water, for a fully customized experience. On a different note, the water jet can be significantly more soothing to people coping with hemorrhoids, rashes or other skin conditions that can be worsened due to excess wiping. Simultaneously, most washlets are energy-efficient. So, even if you enjoy this state-of-the-art characteristic, you don’t have to worry about a pricey energy bill. While it’s true that tankless toilets aren’t as popular as their counterparts, this is likely to change. For one thing, the best tankless toilets are created to address the user’s individual needs and facilitate a personalized experience. 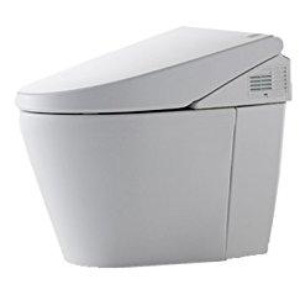 Most units come with state-of-the-art characteristics such as a washlet, remote control, warm seat, adjustable water pressure, automated open-close lid mechanism, air purifier, and the list may go on. Also, they have a minimalist design that fits any bathroom. Nevertheless, all these advantages come at a cost – which is why, in general, tankless toilets are a significant investment. This is why it’s necessary to do some proper research before making the purchase. Additionally, you should determine whether your bathroom supports the installation of such a unit. That being said, we hope that our tankless toilets reviews have shed some light on this subject.